English: This is CDC Clinic Chief Nurse Lee Ann Jean-Louis extracting Influenza Virus Vaccine, Fluzone® from a 5 ml. vial. (Photo credit: Wikipedia) You go, girl! The recent firing of 8 healthcare workers who refused to get a flu vaccination at Goshen Hospital in Indiana is not surprising. As influenza season kicks into hyper-drive, hospitals unleash the latest public relations strategy in making patients believe they are safer – mandatory flu vaccination for healthcare workers. The reasoning is that hospital inpatients are already vulnerable to infection and preventing healthcare workers from infecting them, because the healthcare worker has immunity due to the flu vaccine, will save lives. This mindset has a few flaws. With the average age of registered nurses at 46 and doctors at 51, I’d guess the vaccination effectiveness is in the 50-70% range. Oh, and did I mention if you’re going to get immunity, it can take up to 2 weeks after the shot to get immunity? Even if it did confer immunity to 100% of the healthcare workers who received it, they are not the only carriers of influenza. Since the infected are able to infect others one day BEFORE getting symptoms and up to seven days AFTER getting sick, think of all of the other traffic in a hospital including visitors, admitted patients, and vendors. Are they all vaccinated against flu? Who knows. Can hospitals require them to receive vaccination? I’m guessing the answer is no. 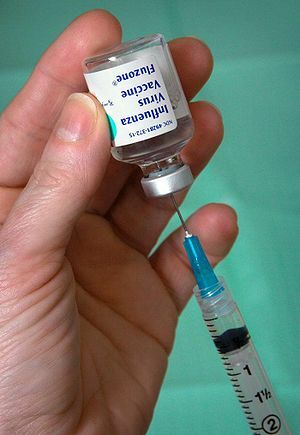 This means in a perfect world, with every healthcare worker not only immunized but also immune, there would still be potential flu carriers wandering the halls every single day. Since the flu can be spread to others up to six feet away, a vendor or visitor at the nurses station can infect a patient who is walking nearby for physical therapy. Unless hospitals go into lock-down at the start of flu season, a strategy of mandatory vaccination leaves plenty of room for infection. Forcing people to get immunized for flu or lose their job is easy. In my book, proving that it is the best and most effective option to save patient lives is a little bit harder. Having worked in a number of healthcare institutions, I know most healthcare workers work sick for a number of reasons including managers who penalize them and co-workers who resent working short-handed. I also know that hand hygiene, considered the baseline measure to prevent the spread of disease, is nowhere near 100% in organizations. Instead of picking the low hanging fruit of vaccination, organizations should look toward preventing all healthcare acquired infections. I’d love to see someone fired for not washing their hands. Instead, Goshen Hospital fires 8 out of 1300 people who refuse vaccination. It makes me wonder about the 1292 workers who didn’t get the vaccination, but were allowed to keep their job. Maybe the excuse was they don’t provide direct patient care. Maybe the hospital couldn’t take the financial hit of losing certain positions, such as doctors, surgeons, and top administrators. Firing front line staff, such as nurses, therapists, housekeepers and food service workers, has always been easier than the politics of firing the rainmakers of healthcare. Perhaps this is just the first salvo organizations will fire in the crusade to show their commitment to patient safety. Imagine a hospital website proclaiming, “100% flu vaccination rate” instead of “71% rate of compliance with washing hands between patients.” The illusion of safety provided by mandatory immunization shouldn’t be confused with the reality of 1.7 million hospital-acquired infections and 99,000 associated deaths each year. For now, firing a few employees for show will have to do. I know I feel safer. This entry was posted in healthcare and tagged Centers for Disease Control and Prevention, Flu season, Goshen Hospital Indiana, Health care, Health care provider, Hospital, Influenza vaccine, Randomized controlled trial, Vaccination.